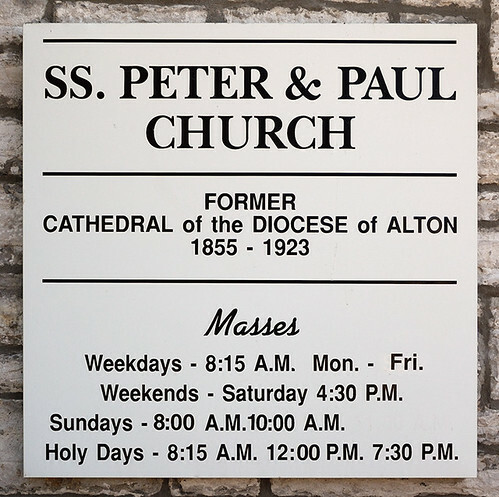 HERE ARE PHOTOS of Saints Peter and Paul Church, in Alton, Illinois, former Cathedral of the Diocese of Alton. Located high on the bluffs in this Mississippi River town, it is about 23 road miles north of downtown Saint Louis, Missouri. 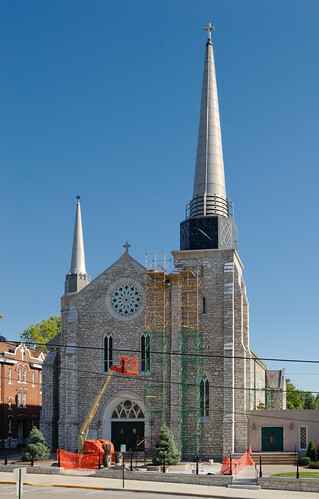 From 1855 to 1923, this was the Cathedral church of the Diocese of Alton; the Episcopal See was subsequently moved, and is now known as the Diocese of Springfield in Illinois. Click here for some photos of the present Cathedral, taken last year. This region was at one time a part of the Archdiocese of Saint Louis. The first two Bishops of the diocese are entombed in this church. The church was designed the architect Thomas Walsh, and consecrated by Archbishop Peter Richard Kenrick. Walsh also worked on Saint Alphonsus Liguori and Saint Francis Xavier churches in Saint Louis, and DuBourg Hall at Saint Louis University. The clock tower dates from 1931; the interior was renovated in 1983 and 2003. Click here for a history of the church. The church is undergoing repairs, and I hope to take more photos after. 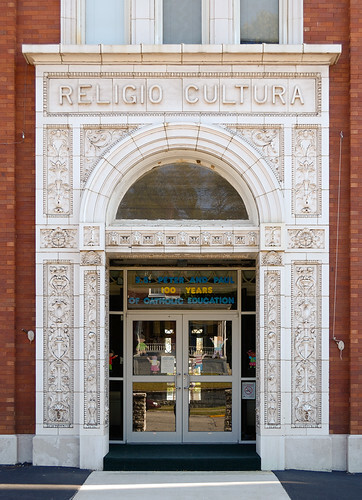 The school's cornerstone reads "Cathedral School, 1908". What a fine blog. There are certainly a number of churches especially in St. Paul, Minnesota including the St. Louis Church downtown that you would probably find of interest as well. I've long gotten mailings and humbly have given back a pittance to the http://www.amm.org/ Association of the Miraculous Medal run by Vincentian fathers in Perryville Missouri. If you are ever in that area, that might be an interesting story if you have not done that one yet. Too, I use to buy things from a Vietnamese oriented Catholic store in Missouri.